“Here’s what I found: Romance and Amish fiction are hot. I don’t mean just popular-hot, I mean scorching-hot, like there’s-no-competition-hot. Yeah, yeah, yeah, nothing new there. Actually, though, I went deeper than that. I counted. I went through two full aisles of Christian fiction and numbered the titles (it was a very slow signing and I had lots of time on my hands). Now some of you know that a very similar experience with Christian bookstores actually drove me to pick up a laptop and begin writing the kinds of books I loved… the ones that were notably absent from the shelves. At the time, I thought the Christian market just needed more good authors writing speculative fiction. I could not have been more wrong. I’ve since discovered a whole world of largely indie and small press Christian spec-fic authors whose work is just amazing! BUT you don’t see THOSE books in the Christian bookstores. Why? Interestingly enough, Amazon just released a new Christian fiction imprint called “Waterfall Press, which will specialize in Christian fiction and nonfiction titles. 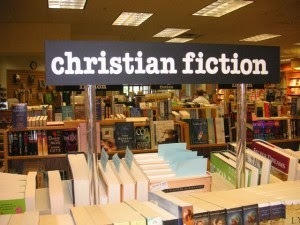 Note what’s missing: Speculative fiction, just as in the Christian bookstores. Again, why? It cannot be that the whole Christian world despises the supernatural, science fiction, fantasy, horror and what-have-you. If that were so, how did Ted Dekker, Frank Peretti and Left Behind become best-selling household names? For that matter, what about CS Lewis and Tolkien? I think that the whole thing comes down in large part to a self-fulfilling prophecy. No space is allotted to speculative fiction and therefore there is no demand for it. How can people get an appetite for something they’ve never tasted? They don’t publish this stuff and then they tell us it doesn’t sell and it’s not what the Christian market wants. How would they know? And again how do they explain away the success of non-Amish/non-romance fare like Peretti and Dekker when they finally allot them exposure and publication? Shelving Our Faith: Are Bookstore Trends A Reflection of USAmerican Christianity? And Should We Be Concerned? Sad, but true! I also write Christian speculative fiction, and I'm always so disappointed when I go into bookstores and find nothing in the way of Christian fantasy/sci-fi, etc. Ugh. What can we do about it, do you think?! I'm thankful when I find a half dozen speculative fiction titles at my local Christian bookstore, and I try to buy them there (and not online) so that way the bookstore owner keeps them coming. I'm also thankful that she is willing to have my indie-published book on her shelves, but she's not a chain Christian bookstore owner, but an independent Christian bookstore owner so she hasn't completely been sold on the “only Amish romance sells” idea. I suggest looking for independent Christian bookstores, and then buying only speculative fiction there and encouraging others to do the same. That's just my idea anyway for trying to make a difference. I love that you support your local store, Tyrean! Unfortunately my local Christian bookstore went out of business about a decade ago, and they never carried speculative fiction much to begin with. I ran into these exact problems when pitching my first novel, which was very Peretti-like, and in the end I realized my work going forward would fit into this market even less, so I both went to fantasy/literary in the general market and went indie. You'll find a lot of diverse writers in that space, because there's a little breathing room. But even in the mainstream market, romance is a huge machine, and publishers and agents wanted me to fit my book to a different set of standards (wanting me to pad my novel to standard length, for instance, and are leery of spiritual themes) that were also a bad fit for what I'm trying to do. So, will I find readers? Remains to be seen. I went indie, and I had 3500 people download that first novel during a launch promotion, which pushed it to the top 5 of the Kindle free titles for Christian suspense and occult/supernatural. But now I'm virtually invisible again. I am hoping to overcome this by launching 6 titles in one year, doing the launch promotions and Goodreads giveaways and blog tours which have reached a lot of people for me, and building from there. But it sure would be nice if there were, I don't know, a system or some support in place to help me get out there beyond these efforts. If I wrote Amish romance this would be a different story, but I just can't stomach it. I wonder, though, in reference to the first comment about whether there might be anything we can do: romance is huge because most book buyers are middle-aged women who like romance. As a GenX/GenY wedgie, the closest I can see to my generation liking romance once they become the dominant book buying demographic is liking chick lit or paranormal romance or something. Most people my age like very different content, and lots of it is supernatural. I wonder if another speculative market is on the way just by the grace of shifting tastes? Maybe this is just a little pipe dream of mine, but TV show trends seem to support this idea: just think of all the fairytale/sci-fi/paranormal stuff out there now. But for the Christian market? I don't know. My generation is generally leaving the church entirely, not reshaping it, so again I think you'll probably find readers in the general market, whether you're Christian or not in content. Christian fiction has bled itself dry, IMHO. Amish romance dominance isn't a sign of a healthy market. It's a sign of being anemic in every genre that doesn't sell itself. That last sentence was nicely put!